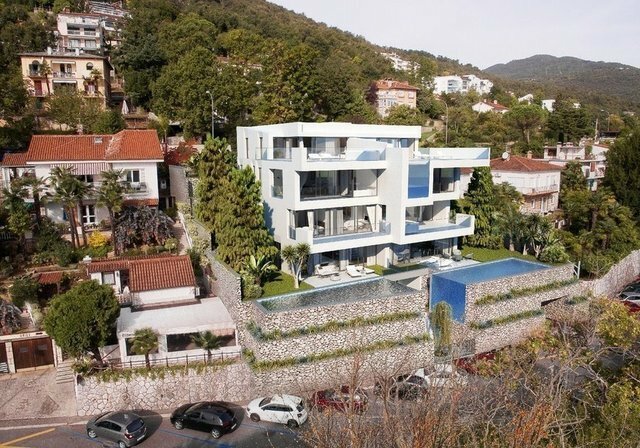 Princess Diamond apartment at Diamond residence in Opatija is positioned on the penthouse level and is a two-level apartment on the second and third floor of the apartment residence. Princess Diamond penthouse apartment consists of 3 bedrooms with ensuite bathrooms, toilet for quests, laundry rooms, living area of 73 square meters ( kitchen, dining room and living room) and a terrace of 60 square meters with the infinity swimming pool of 25 square meters, storage area, engine room and four parking spaces ( three in the garage and one outdoor next to the entry doors of the apartment. Princess Diamond is an apartment with comfortable and spacious rooms with 64 square meters living room, this apartment is a luxurious apartment for staying and enjoying the charms of the Mediterranean and Kvarner Bay within 5 minutes reach of famous Opatija promenade along the sea. Diamond residence with luxurious apartments is close to Rijeka airport, Zagreb and Pula airport and offers exquisite and incomparable apartments for private luxurious enjoyment.